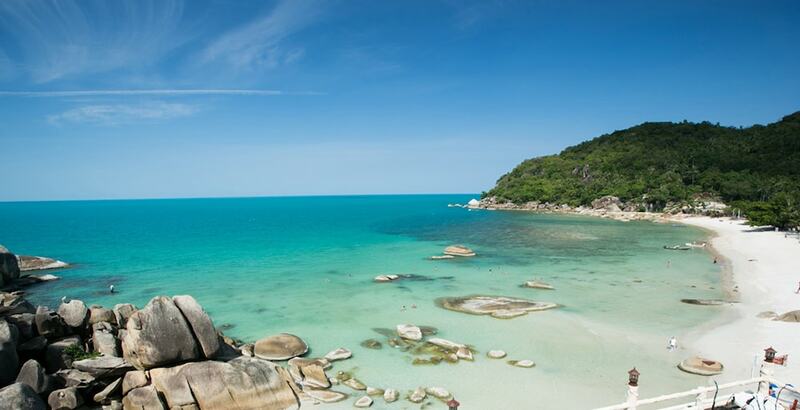 Silver Beach is a 250m-long tropical beach paradise set in a charming little bay facing northeast located just north of Lamai Beach, at the foothills and cliffs separating Lamai from the more popular Chaweng area on the east coast of Koh Samui. Also known as Haad Thong Ta-khian (which in Thai means ‘the beach of the Ta-khian Trees’) Silver Beach hosts four long-established hotels and restaurants: Crystal Bay Beach Resort, Silver Beach Resort, Thongtakian Resort, and Crystal Bay Yacht Club which occupy the full length of the beach. Nevertheless, and according to Thai law, even if you’re not staying at one of the hotels you’re still free access to this tranquil strip of sand which offers some particularly good sunbathing, swimming and snorkelling opportunities. The idiom ‘Good things come in small parcels’ suits Silver Beach perfectly. The beach is small but still has plenty of room to welcome outsiders due to the fact it is not (yet) very well-known. The bay is stunning and offers excellent snorkelling opportunities along the rocks at both ends. A few large granite boulder rocks are erected (Hin Ta & Hin Yai are not that far) in the water and on the beach obliging swimmers should be cautious. Sea kayaks are available for rent for a few hundred baht at the four hotels occupying the beach. Two beach massage parlours are also available under the shade of the trees; they offer a great range of massages, treatments and manicure/pedicure. Massage prices are in line with other Koh Samui beaches, most one hour massages are around 200-300 baht. Crystal Bay Beach Resort and Spa is situated at the northern end of the beach. This 3-star hotel hosts a total of 24 beachfront, sea view and garden rooms, all of them provided with basic amenities including free Wi-Fi. The hotel’s restaurant features a terrace overlooking the emerald waters of the bay; Thai and international favourites are served here from 08:00 ‘til 22:00. Silver Beach Resort & Restaurant hosts 35 bungalows available in four types - Beachfront Standard and Villa, Garden, and Mountain. It is an unpretentious and very affordable place to spend a relaxing time in Samui. The resort’s restaurant features both indoor and outdoor areas with great views to the sea. Thongtakian Resort is the most recent accommodation choice on Silver Beach. Designed in a contemporary style, this hotel has a good choice of rooms and bungalows featuring standard amenities. The resort’s beachfront restaurant is an great place to lunch or dine on local seafood and western classic dishes. Crystal Bay Yacht Club (aka Samui Yacht Club) is set at the southern end of the beach. It is a stylish 4-star resort perfectly integrated into the surrounding environment. Featuring 43 villas categorised in six types – Family, Beachfront, Seaview, Deluxe, Seaview Deluxe, and Garden – all of them air conditioned and provided with top-notch amenities. Regarding facilities, Crystal Bay Yacht Club hosts a dive centre – Easy Divers – offering a wide choice of day trips and PADI courses. Summing up, Silver Beach is a great place to spend a day or to stay while in Koh Samui. Its location, a few minutes’ drive from Lamai and about 10 minutes from Chaweng, also allows holiday-goers to fully enjoy all of what these popular areas have to offer in the way of dining, shopping, and nightlife.